Lauren Regan is headed to Clearwater County MN, to argue the Necessity Defense along with co-counsel Tim Phillips of Minneapolis and Kelsey Skaggs, on behalf of brave Valve Turners, Emily and Annette Klapstein, and climate activist (and repeat CLDC client) Ben Joldersma. Two years ago they turned off 2 pipeline valves off at the border of the US and Canada to stop tar sands oil from coming into the United States from the horrifying Alberta tar sands mines. They did this because they knew that the time had come for people to take matters into their own hands to fight this catastrophic climate disaster! This is a historic moment for direct action and for the legal arm of the climate movement. Come join us in MN to watch an impressive witness list, of scientists, policy makers, philosophers and organizers testify that we our planet is in a crisis and the government is not doing nearly enough to reverse it. The people are speaking in the streets, in the media, at the pipeline blockades, and at the politicians’ offices… now we will get the chance to speak in the courtroom! The CLDC is honored to represent these brave activists and hope that you all follow along for the trial! We will be posting daily updates from the courtroom, along with select video of the trial if allowed by the judge. 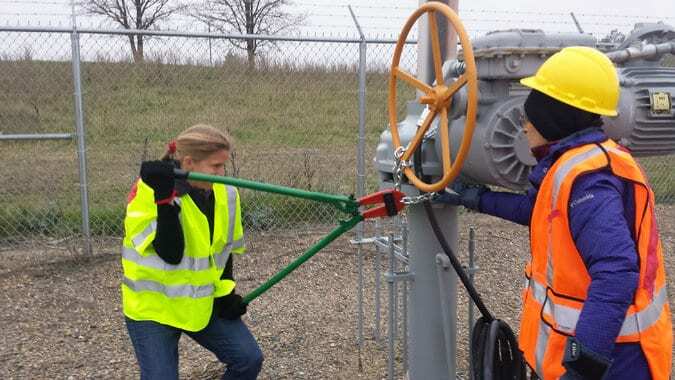 Help support our work defending the Valve Turners and fighting for the necessity defense by donating today! If you would prefer to donate by check you can mail donations to: Civil Liberties Defense Center, 1430 Willamette St., #359, Eugene, Oregon 97401.